In the world of Mac software, few brands reach as far back as Retrospect. Originally conceived in the 1980s by Dantz Development, Retrospect reigned as the premiere Macintosh backup product for more than a decade. But then Dantz was acquired by enterprise software giant EMC, and the product became something of a football, passed from one corporate owner to another; the Mac version in particular was neglected to the point of near oblivion. In the meantime, Apple’s dead-simple Time Machine backup app and its Time Capsule ( ) hardware, along with disk-copying products like Carbon Copy Cloner ( ) and SuperDuper ( ) filled the void. Now the recently formed Retrospect Inc. has shipped Retrospect 9 for Macintosh. Can this software still be relevant? Retrospect 9.0 is designed to fill the space between personal backup products such as Time Machine and enterprise-grade software that protect servers and workstations by the thousands. A server running Retrospect can manage backups for a hundred or more computers; variables including network performance, server hardware, and backup-media speed make it difficult to put a specific ceiling on the number of clients a single Retrospect installation can support. Given all that, the ideal Retrospect customer is probably a small company with a handful of servers and a few dozen workstations. I looked at the single-server edition of Retrospect, but the company also offers a $129 five-user “desktop” version that omits network client support and a $1,669 multi-server version for larger networks. The price you pay depends on the number of backup servers and clients you need to support and any optional add-ons, such as support for high-end tape backup devices. Once you’ve set up the administrative tools, you install client software on the individual workstations you want backed up; those machines can be any combination of Macintosh, Windows, and Linux computers. A menu bar icon provides access to the client’s backup state and allows the user to request immediate backup and initate a restore without help from the administrator. Retrospect can peacefully coexist with Time Machine and other local backup software; just avoid scheduling them to run at the same time, or the computer’s performance could slow to a painful crawl. Macintosh clients running virtual operating systems, such as Parallels Desktop ( ) or VMWare Fusion ( ), can install the appropriate Retrospect client in their virtual machines; as long as those guest OSes are running, Retrospect can back them up like any other computer. Contrast that with local backup products like Time Machine, which will back up the virtual OS’s multi-gigabyte image file in its entirety every time it changes. Retrospect's administrator's interface can be confusing; configuration tools are scattered throughout the program. If you’ve got the bandwidth, Retrospect can automatically save information to any WebDAV server. (Go ahead, call it the "cloud"). It’s a bring-your-own-provider affair, however: No preset configurations for storage providers are offered. 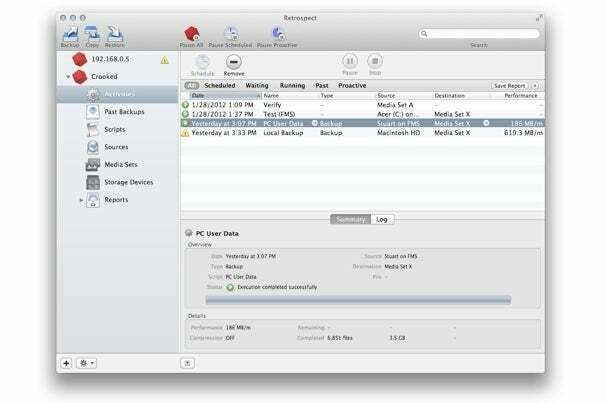 At the time a backup set is created, you can assign security restrictions to it. These range from simple passwords up to AES-256-bit key encryption. Whatever security you opt for is applied to all the tapes or discs that become a part of that media set. The New Script dialog presents nine varieties of scripts. Script options are configured in a second tabbed window. A Rules tab is used to designate which files are backed up. Retrospect includes some pre-defined rules, such as “User Files and Settings” or “All Files Except Cache Files,” but you can also create custom rules based on things like file name, location, or even the Finder’s color labels. But you can’t do that while setting up a script; defining rules requires a trip to the Preferences. Sigh. Once you’ve got everything set up, Retrospect 9 performs well. In my testing, backing up a 3.5GB Windows user folder over ethernet to a FireWire 800 drive was accomplished with a copy speed of 186MB per minute; with full verification, the whole backup finished in about 24 minutes. When backing up local files on the Mac running Retrospect to the same external drive, performance leapt to 619MB per minute. Many variables affect performance, but my experience suggests that if you hit a bottleneck, it’s going to be in the network or the media, not in the Retrospect software. Restoring data is the crucial second half of any backup regimen, and Retrospect makes it quick and easy. In the course of backing up, Retrospect maintains a database (called a "catalog file") of everything that gets backed up. When it's time to restore, Retrospect presents a dialog box where you enter search criteria for the file in question. Even if you don’t recall the name, you can use attributes such as file-type, enclosing folder, and creation date to winnow the choices. After you select the media sets to be searched, Retrospect will present a list of the matching files, including the date each one was backed up. You can resore any or all of the matching files to a local hard drive or a network client. Most of what makes Retrospect compelling is essentially invisible. It’s incredibly efficient at optimizing data storage; if ten computers on the network all have a copy of the same file, Retrospect just backs it up once. When restoring a folder to previous point in time, the program compares the current state of that folder to the backup and just restores the files that differ. Even choosing what to back up when is well thought out. The Proactive Backup feature scans the network for laptop clients that come and go from the network. When a laptop that’s overdue for a backup appears on the network, Retrospect will push it to the front of the queue. It's just too bad that, like the stereotypical nerd, Retrospect often obscures its impressive smarts with flawed interpersonal skills. Retrospect 9.0 is powerful, reliable backup for professionals and organizations that require more than simple desktop-grade solutions. It takes a system administrator to see the beauty beneath its flawed exterior, but even the boss can appreciate Retrospect’s value. No other product offers Retrospect’s capabilities in a multi-platform setting for anywhere near the price. Stuart Gripman is the coauthor of FileMaker Pro 11: The Missing Manual (O'Reilly Media, 2010) and founder of Crooked Arm Consulting.